/usr/bin/whoami @efinlay24 #CodeMonsters I'm a Senior Integration Engineer at the Financial Times. I originally started off in desktop support, then spent some time as a Linux sysadmin Currently I lead a team at the FT, who support and maintain our backend Content APIs, working with k8s, Docker and Go microservices. Everyone feels the same at the start. I still do today. 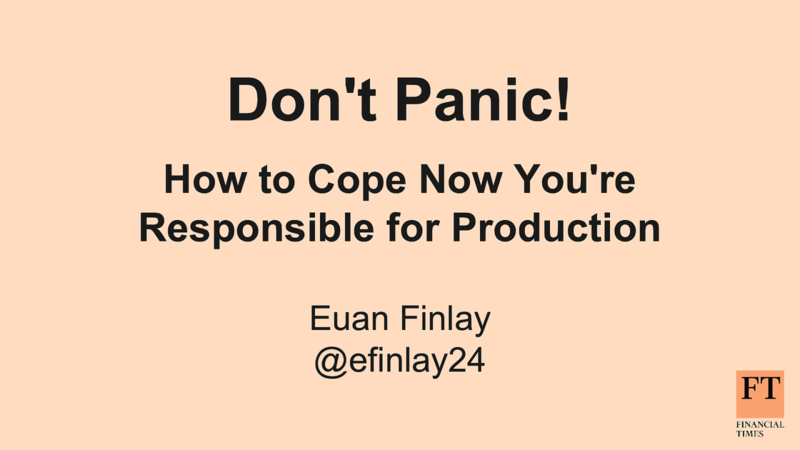 @efinlay24 #CodeMonsters It's something like imposter syndrome no matter how good you are, I suspect everyone feels something similar the first time they get called out or start handling production incidents even now, with experience - I still get a twinge of fear whenever my phone goes off in the middle of the night - what if it's something I can't fix? - what if I'm not good enough? The Ghost of Incidents Future so knowing that things will go wrong at some point what can we do to plan ahead? The Ghost of Incidents Present but something's happened - alerts have gone off, and you've been called or been asked to investigate what's the first steps that you should take? What's the actual impact? @efinlay24 #CodeMonsters what's the actual impact? For example - for my team at the FT, we're a content company - our most critical considerations are: can the journalists publish content? can customers access the website? A problem preventing the news from going out is a huge issue, and we'll immediately get multiple people investigating ASAP. However, if our Jenkins box alerts that it's running low on disk space over a weekend? I'm unlikely to care, and I'll fix it on Monday If overnight and it doesn't need to be fixed immediately, it's often safer to wait until morning, when you have a clearer head and more eyes on the fix. Don't be afraid to call for help. @efinlay24 #CodeMonsters That's ok! Call for backup, if you can it's often better to bring other people in, and get help quickly. You can't always fix everything on your own - and that's ok having diverse teams is really important for this everyone has different experiences and ideas, and will approach problems in different ways Don't be afraid to ask for assistance if you need it. Nobody will think less of you. Create a temporary incident channel. @efinlay24 #CodeMonsters spin up a new channel or group, specifically for this incident this comes back to communication - if you have multiple people investigating / fixing a problem, you need somewhere they can coordinate. This is especially true if there are people from multiple teams, areas of the business, or even companies it helps a lot with having a incident timeline later on so that you can go back and see who was doing what, when. The Ghost of Incidents Past what do you need to do once the dust has settled, and you're back online? View Don't Panic! on Notist. More and more developers are expected to be on-call, provide out-of-hours support, and respond to production outages. Without much experience handling incidents, it can be scary, intimidating, and feel like being dropped in the deep end. But it doesn’t have to be that way! Over the past few years on the FT’s Content team, we’ve transformed our incident response – from a number of mildly terrifying multi-hour outages, to a stable platform where team members feel comfortable on-call. Euan puts presentations on for free. You can too.